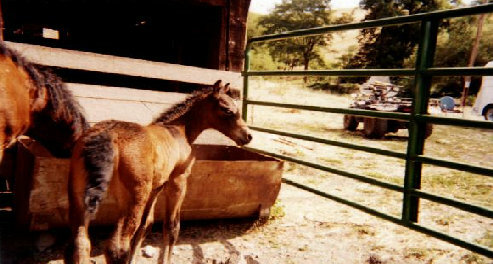 Moonlit Day (Daisy is a very curly filly born 7-25-01. Her Dam is Katen Takawitha ABC P 2073 and her sire is Yellow Hornet ABC P 878 (f) Daisy is a dark Bay filly that has a black "cape" over her shoulders, back and rump. She is halter broke, and leads. We also handle her feet. We offer her for sale for $ 1800.00 at fall weaning. A deposit will hold her until that time.